Chile is a relatively stable, well-connected, open economy. Over the last decade the country has managed to increase its participation in global value chains and to export new products. However, its knowledge base is limited, productivity is stagnating and economic opportunities are still concentrated in a few places and limited to a few activities and firms. Today’s global production revolution offers a window of opportunity for Chile to “update” its growth model to become more inclusive and sustainable. The Production Transformation Policy Review of Chile (PTPR) uses a forward-looking framework to assess the country readiness to embrace change, with perspectives on solar energy, mining and agro-food, and identifies priorities for future reforms. This review is the result of government-business dialogue and rigorous analysis. It benefitted from peer learning from Sweden, Germany and the Emilia Romagna Region in Italy through the OECD Initiative for Policy Dialogue on Global Value Chains, Production Transformation and Development. What's next on Chile's growth and development agenda? The report was launched in Santiago, Chile on 9 January 2018. The event was co-organised by CORFO, DIRECON, OECD, UNCTAD and UNECLAC. Press Release : Chile needs a renewed pact between government, business and civil society (en español). 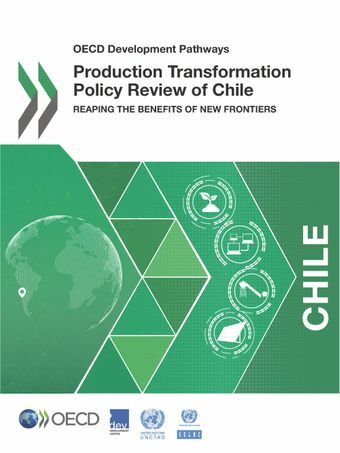 Advisory/Asesoramiento: Launch of the OECD Production Transformation Policy Review (PTPR) of Chile (en español). Download the agenda of the event (en español). Peer learning and knowledge sharing lie at the heart of the Production Transformation Policy Reviews (PTPR) process. The value of multi-stakeholder dialogues and peer-reviews is to bring together stakeholders and obtain information not accessible otherwise. This report has been shaped and enriched by the contributions of the peers, the Peer Learning Group (PLG) set up to steer the review process and the debates in the Plenary Meeting of the Initiative. The three peers of the PTPR of Chile are the German Aerospace Centre (DLR) (Germany), the International Council of Swedish Industry (NIR) (Sweden) and the Emilia Romagna Region (Italy). The Peer-Learning Group (PLG) Meeting of the PTPR of Chile was organised in the framework of the review, on May 2017, in Paris. Read the Agenda. The outcomes of the PLG Meeting are summarized in the scorecards below. Additional scorecards with the outcomes of the PTPR of Chile will be published soon.